Introduction to Cryptococcus infections Cryptococcus neoformans is a yeast-like saprophytic fungus that can cause severe infections, often in individuals with impaired cell-mediated immunity (e.g. AIDS) or other underlying medical conditions, such as end stage organ disease, which was present in the current case.1,2 The overall incidence of infection in the United States is about 1 per 100,000 with about a 12% mortality rate.3 The incidence in those with AIDS is significantly greater than the general population. Between 0.2 to 2.9% of those with AIDS have detectable levels of C. neoformans complex.3 Primary C. neoformans complex infections often occur in the lungs, and dissemination to the central nervous system (CNS) is possible. Infections can be indolent, and signs and symptoms can include headache and cranial nerve palsies, as was present in the current case. Exposure is classically associated with aerosolization of droppings from birds (e.g. pigeons) or from bats (e.g. in caves). The Cryptococcus fungal genus is comprised of multiple species. The most commonly identified human pathogens in the genus are C. neoformans and C. gattii, which appear similar when cultured in the laboratory and can be clinically reported as a single taxonomic complex (i.e. Cryptococcus neoformans complex). There are several means by which the laboratory can help to diagnose a patient with a Cryptococcus neoformans complex infection: direct observation of C. neoformans in a patient sample, direct detection of C. neoformans nucleic acid in a patient sample, direct immunologic detection of C. neoformans in a patient sample, or culture and subsequent characterization of C. neoformans by phenotypic, genetic, or proteomic identification. In this case, a presumptive identification of C. neoformans was made directly from the patient's cerebrospinal fluid (CSF). Differentiating these organisms from other yeasts by Gram stain is very difficult (Figure 1). Classically, cryptococci in CSF can be identified with high specificity using an India ink preparation, which was done in this case (Figure 2). The India ink does not penetrate the cryptococcal carbohydrate capsule. This capsule is comprised primarily of glucuronoxylomannan, which is a polysaccharide of mannose, xylose, and glucuronic acid.7 The lack of India ink penetration of the capsule allows the yeast cells and their capsules to be highlighted in high contrast to the inky background. 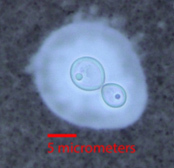 Typically, the size of the yeast cells is variable, but they are often 4-8 μm in diameter. Narrow-based budding can be present, as was seen in this case (Figure 2). A unique feature of the C. neoformans complex that helps to differentiate it from other Cryptococcus spp. is the production of phenol oxidase, which can metabolize caffeic acid to melanin. Melanin is a virulence factor that protects the fungus from oxidation from white blood cells.19,20 One medium that contains caffeic acid is birdseed agar, so colonies of C. neoformans complex that are grown on birdseed agar develop a brown color.18,19 Alternatively, filter paper containing caffeic acid can be inoculated with a cryptococcal colony and observed for the development of brown pigment. The C. neoformans complex organism was also detected by CSF culture and blood culture. Initial immunoassay results from CSF and serum identified the antigen at a titer ≥1:1024. The patient was started on antifungal therapies and intracranial pressure was managed. Four weeks later, the serum titer decreased to 1:512 and lumbar puncture opening pressure had decreased to within normal limits. Pappas PG, Perfect JR, Cloud GA, et al. Cryptococcosis in human immunodeficiency virus-negative patients in the era of effective azole therapy. Clinical infectious diseases : an official publication of the Infectious Diseases Society of America. Sep 1 2001;33(5):690-699. Franco-Paredes C, Womack T, Bohlmeyer T, et al. Management of Cryptococcus gattii meningoencephalitis. The Lancet. Infectious diseases. Nov 26 2014. C. neoformans Infection Statistics. Fungal Diseases 2014; http://www.cdc.gov/fungal/diseases/cryptococcosis-neoformans/statistics.html. Accessed 15 December 2014. Kwon-Chung KJ, Varma A. Do major species concepts support one, two or more species within Cryptococcus neoformans? FEMS yeast research. Jun 2006;6(4):574-587. Franzot SP, Salkin IF, Casadevall A. Cryptococcus neoformans var. grubii: separate varietal status for Cryptococcus neoformans serotype A isolates. Journal of clinical microbiology. Mar 1999;37(3):838-840. Meyer W, Aanensen DM, Boekhout T, et al. Consensus multi-locus sequence typing scheme for Cryptococcus neoformans and Cryptococcus gattii. Medical mycology. 2009;47(6):561-570. Zaragoza O, Rodrigues ML, De Jesus M, Frases S, Dadachova E, Casadevall A. The capsule of the fungal pathogen Cryptococcus neoformans. Advances in applied microbiology. 2009;68:133-216. Binnicker MJ, Jespersen DJ, Bestrom JE, Rollins LO. Comparison of four assays for the detection of cryptococcal antigen. Clinical and vaccine immunology : CVI. Dec 2012;19(12):1988-1990. Hansen J, Slechta ES, Gates-Hollingsworth MA, et al. Large-scale evaluation of the immuno-mycologics lateral flow and enzyme-linked immunoassays for detection of cryptococcal antigen in serum and cerebrospinal fluid. Clinical and vaccine immunology : CVI. Jan 2013;20(1):52-55. Dalle F, Charles PE, Blanc K, et al. Cryptococcus neoformans Galactoxylomannan contains an epitope(s) that is cross-reactive with Aspergillus Galactomannan. Journal of clinical microbiology. Jun 2005;43(6):2929-2931. IMMY CrAg Lateral Flow Assay for the Detection of Cryptococcal Antigen. Package Insert: Immuno-Mycologics, Inc.; 16 April 2014. McManus EJ, Jones JM. Detection of a Trichosporon beigelii antigen cross-reactive with Cryptococcus neoformans capsular polysaccharide in serum from a patient with disseminated Trichosporon infection. Journal of clinical microbiology. May 1985;21(5):681-685. Sugiura Y, Homma M, Yamamoto T. Difficulty in diagnosing chronic meningitis caused by capsule-deficient Cryptococcus neoformans. Journal of neurology, neurosurgery, and psychiatry. Oct 2005;76(10):1460-1461. Rappelli P, Are R, Casu G, Fiori PL, Cappuccinelli P, Aceti A. 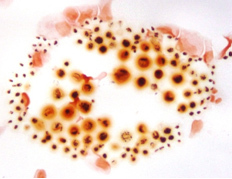 Development of a nested PCR for detection of Cryptococcus neoformans in cerebrospinal fluid. Journal of clinical microbiology. Nov 1998;36(11):3438-3440. Qishui O, Ling J, Ni L, Bin Y, Wen L. Comparison of real-time florescence quantitative PCR measurements of VAD1 mRNA with three conventional methods in diagnosis and follow-up treatment of Cryptococcus neoformans infection. Mycoses. Jul 2012;55(4):326-332. Martins ML, Ferreira AS, Sampaio A, Vieira R, Inacio J. Direct and specific identification of Cryptococcus neoformans in biological samples using fluorescently labelled DNA probes. European journal of clinical microbiology & infectious diseases : official publication of the European Society of Clinical Microbiology. May 2010;29(5):571-576. Favaro M, Savini V, Favalli C, Fontana C. A multi-target real-time PCR assay for rapid identification of meningitis-associated microorganisms. Molecular biotechnology. Jan 2013;53(1):74-79. Howell SA, Hazen KC. Candida, Cryptococcus, and Other Yeasts of Medical Importance. Manual of Clinical Microbiology. Vol 2. Canada: American Society for Microbiology; 2011. Winn W, Allen S, Janda W, et al. Chapter 21: Mycology. Koneman's Color Atlas and Textbook of Diagnostic Microbiology. 6th ed. Philadelphia: Lippincott Williams & Wilkins; 2006. Wang Y, Aisen P, Casadevall A. Cryptococcus neoformans melanin and virulence: mechanism of action. Infection and immunity. Aug 1995;63(8):3131-3136. Chen SC, Meyer W, Sorrell TC. Cryptococcus gattii infections. Clinical microbiology reviews. Oct 2014;27(4):980-1024. Cryptococcus gattii. 2014; http://www.mycology.adelaide.edu.au/Fungal_Descriptions/Yeasts/Cryptococcus/C_gattii.html. Accessed 8 December 2014. Espinel-Ingroff A, Chowdhary A, Cuenca-Estrella M, et al. Cryptococcus neoformans-Cryptococcus gattii species complex: an international study of wild-type susceptibility endpoint distributions and epidemiological cutoff values for amphotericin B and flucytosine. Antimicrobial agents and chemotherapy. Jun 2012;56(6):3107-3113. Firacative C, Trilles L, Meyer W. MALDI-TOF MS enables the rapid identification of the major molecular types within the Cryptococcus neoformans/C. gattii species complex. PloS one. 2012;7(5):e37566. Lohmann C, Sabou M, Moussaoui W, et al. Comparison between the Biflex III-Biotyper and the Axima-SARAMIS systems for yeast identification by matrix-assisted laser desorption ionization-time of flight mass spectrometry. Journal of clinical microbiology. Apr 2013;51(4):1231-1236. Perfect JR, Dismukes WE, Dromer F, et al. Clinical practice guidelines for the management of cryptococcal disease: 2010 update by the infectious diseases society of america. Clinical infectious diseases : an official publication of the Infectious Diseases Society of America. Feb 1 2010;50(3):291-322.